A huge thank you goes out to all of our monthly supporters on Patreon. We couldn't do it without you. Enjoy the latest monthly wallpaper! This one arrives a bit late due to the holidays and the total focus on Star Traders 2 at the moment. However, here is is! With the Heroes story so close to wrapping up, I am doodling on the Legends of Steel story and characters now. 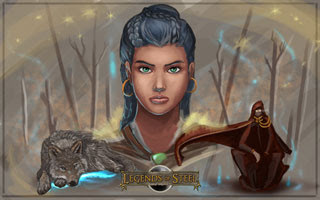 The Heroes story has been pretty well set for a long time now, but it is exciting to dream about the Legends storyline. We've got a lot of the big Legends details pinned down, but the exact characters, telling, and story arcs are still to be nailed. This wallpaper is a concept art of a trio who are central to the latest concept storyline I wrote down. If you love Trese Brothers games, we hope you'll consider supporting us on Patreon!